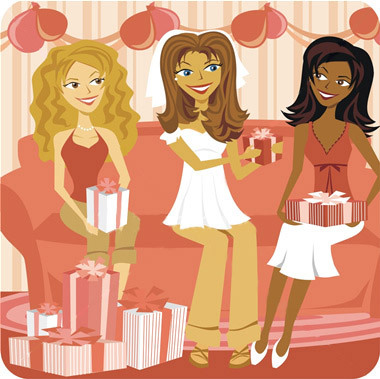 Most women have a brief understanding of bridal shower etiquette for guests, but what about for the bride-to-be? For a bride-to-be, a shower can be both fun and overwhelming, depending on the situation and guests invited. How should the bride act on this special day? Here are some of the things that all future brides should know about bridal shower etiquette. A bridal shower is a special occasion. Often, people who you may not have seen in years will attend. That said, it is important for you to dress appropriately for the bridal shower. This does not necessarily mean that you need to wear a prom gown, of course. Depending on the season of your bridal shower, a sundress will work well. In the winter, any type of dress can be worn. If the bridal shower is going to be less formal, a blouse with a pair of dressy pants or a skirt will be appropriate. Put some thought into what you will wear to your bridal shower. You should never show up in a white t-shirt and torn jeans for any bridal shower, let alone your own. While you may want to spend your time talking to only the members of your bridal party, it is important to make your rounds. Do not spend too much time talking to only one person. You will especially want to talk to people who have traveled a further distance to come to your bridal shower, as well as those that you have not spoken to in a while. It is best to distribute your time equally amongst your guests at your bridal shower. Be sure to consider what bridal shower games you are going to play beforehand. While most bridal shower games are suitable since it is your special day, you will want to think about whether or not they are really appropriate. Think about the different people that will be at the bridal shower, as well as their ages. Anything that is too risk-ay may not go over too well. On the other hand, any bridal shower games that you want your guests to play should be enjoyed at your bridal shower. they get you it is obviously something that came from their heart that they felt suitable for you. Also keep in mind that you should not become upset if more than one of your guests purchases the same gift from your registry. One of the gifts can always be exchanged. Even if you do not particularly like a gift, it is best to show enthusiasm at all times. If you did not care to have a bridal shower but had one thrown for you by a family member or bridesmaid, you should act calm and collected. There is no reason that your guests need to know that you really did not want to have a bridal shower in the first place. It will not only make them feel uncomfortable, but they will also probably look at you as unappreciative. The most important thing that you need to do on this special day is act as though you want to be there. Welcome your guests, be friendly and just have fun – or at least act like you are having fun. Bridal showers are meant to be a very fun experience. However, no guest wants to deal with a “bridezilla” at a bridal shower. It is important to just relax, make your guests feel welcome and have as much fun as you can. This is one occasion that you will want to remember for the rest of your life, so there is no reason not to enjoy it! I just wrote a post about attending showers and was searching for clip art for it when this post showed up in my search. Could I have permission to use your graphic at the top of this post? Sure you can go right ahead and use the picture. Enjoy! Hi, I don’t mean to be redundant, but I was also browsing through the internet for interesting shower pics and yours caught my eye. Could I use it for an event I’m planning? You can of course go ahead and use the picture. Thanks! Great post – love the clipart too!